Artist's concept of Cassini's flyby of Saturn's moon Enceladus. This storywas updated at 5:00 p.m. ET on April 28. The Cassini spacecraftexploring Saturn got a new taste of the ringed planet's moon Enceladus lateTuesday when it flew over the icy satellite in a gravity experiment. NASA's Cassiniprobe glided low over Enceladus Tuesday night toperform an experiment designed to probe the moon's interior composition. Atclosest approach, Cassini flew just 60 miles (100 km) above the surface ofEnceladus at a speed of 15,000 mph relative to the moon. The flyby,which took Cassini through thewater-rich plume flaring out from Enceladus' south polar region, occurred onApril 27 at 8:10:17 p.m. EDT (0010:17 GMT on April 28). Scientistsplanned to use Cassini's radio science instrument to measure the gravitationalpull of Enceladus against the steady radio link to NASA's Deep Space Networkhere on Earth. Detecting any changes will help scientists understand what liesbeneath Enceladus' famous "tiger stripe" fractures, which spew water vapor and organicparticles from the moon's south polar region. Theexperiment was also expected to help scientists learn if the south polarregion's sub-surface resembles a lava lamp. Scientists have hypothesized that abubble of warmer ice periodically travels up to the crust and repaves it,explaining the quirky heat behavior and intriguing surface features of thisregion. 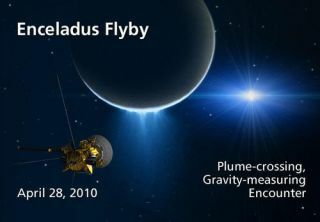 WhileCassini's low flyby would have been ideal for snapping new photos of Enceladus,the primary objective of the mission was to collect information for the gravityexperiment. The Cassiniprobe launched in 1997 and arrived at Saturn in 2004, where it dropped theEuropean Huygens probe on the cloudy surface of the planet's largest moon Titan.Cassini was slated to be decommissioned in September of this year, but has receivedan extended mission that now runs through2017.